A few people were nervous about getting bees from Calif. in the spring due to their drought. I talked to my supplier and he assured me that there will be no problem getting bees and queens next spring. The only issue that we can't control is good weather for queen rearing and mating. This is how I setup my hive for winter. I have just received a shipment of winter hive covers. I woke up this morning to a very picturesque landscape of a coating of snow. This usually causes heart palpitations to beekeepers who haven't finished feeding their bees. As I have always said beekeeping is all about timing, doing the proper management at the right time. Failure to operate in this manner, makes it more difficult at successfully wintering a hive of bees. The colder weather makes it harder to feed. Bees don't like cold syrup. Opening hives this time of year is still no problem. The bees can easily handle these temperatures without any problems. 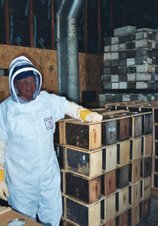 It is still to early to cover bees with winter wraps, after Nov 1st is usually ok.
Wrapping a hive to early can make a hive to hot. I have been asked several times why feeding should be over with by Oct 5th. That date is just a date I always tried to shoot for to finish feeding. I know that the later it gets the bees can become reluctant at taking the syrup as it gets colder. A beekeeper can feed into late Oct. but consider this. Feeding stimulates brood rearing. The later a hive is fed there will be brood hatching out a minimum of 21 days after the feeding is done. The bees have to keep the brood at a higher temperature so they will eat more of their winter stores. Also Varroa will still be increasing their numbers if brood is still being raised. The bees have to convert the sugar syrup to honey. All of this takes more effort that can be prevented by finishing by early Oct. If a hive needs to be fed then of course feed it. By putting two feeder pails on at once can get the food in the hive faster and not drag the feeding out another two weeks.